The Gloster Gauntlet was the last open-cockpit biplane fighter to be used by the RAF. It was originally built to meet the 1926 Air Ministry specification F.9/26, as a successor to the Gloster Gamecock. However, no planes were able to meet this requirement and in 1927, a new specification F.20/27 was issued. 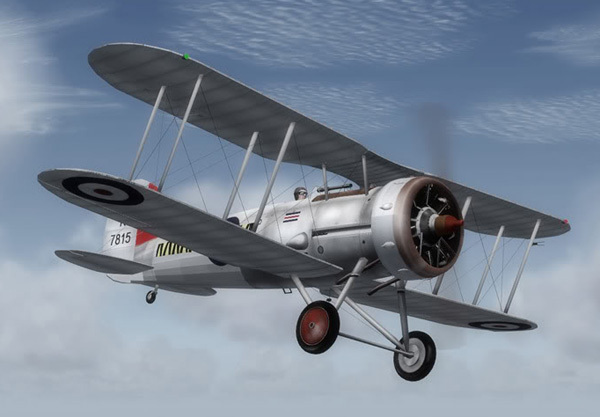 The Gauntlet made its inaugural flight in 1928, but was beaten out by the Bristol Bulldog and Hawker Hawfinch during the trials. Since the Gauntlet came in third and the margin for performance was only slightly less than the winners, Gloster continued development on its own. In 1933, after further improvements, 24 Gauntlets were ordered in 1933. Overall, there weren’t many major outside changes to the Gauntlet during its life, and it was a pretty good airplane from the start. What was lacking at its introduction was a decent engine to power it. Without a suitable engine being available at the time, the Gauntlet just wasn't up to the task and as a result, it did not enter service until 1935. During its development, a variety of engines were tested on the Gauntlet (J9125) prototype. It was first built as the model SS.18 and was powered by a 450 hp (335 kW) Bristol Mercury IIA radial engine. Using the same airframe, it was followed by the SS.18A powered by a 480 hp (358 kW) Bristol Jupiter VIIF engine and the SS.18B was powered by a 560 hp (416 kW) Armstrong Siddeley Panther III engine. Final developments led to the SS.19A and SS.19B. The SS.19A had an improved landing gear and the SS.19B was powered by a 536 hp (400 kW) Bristol Mercury VIS radial engine. In 1934, Gloster was taken over by Hawker Aircraft and the Gauntlet II incorporated the construction methods of Hawker. The rear fuselage was changed to a Hawker system of steel and aluminum tubing, bolted together with fish plates. The tubing used a ball end that was cupped into bolts and passed through the fish plates and braced with cables. 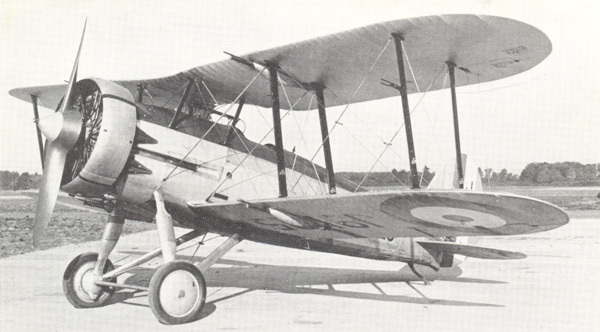 A new wing spar was of the Hawker type using steel strips rolled to form an octagonal structure and connected together with steel webbing. The improved Gauntlet Mk II was the most produced model and 104 aircraft were ordered in April 1935 and an additional 100 aircraft were ordered the following September. It went into service in 1936 with the Nos. 56 and 111 Squadrons and was powered with a more powerful 645 hp (480 kW) Bristol Mercury VIS2 engine. It had a maximum speed of 230 mph (370 km/h), a range of 460 miles (740 km) and a service ceiling of 33,500 feet (10,210 meters). Armament consisted of two Vickers .303 caliber synchronized machine guns. Due the unreliability of the Vickers guns, they had to be placed in the cockpit to allow the pilot access to clear gun jams. Some pilots actually carried a mallet in the cockpit to whack the guns back into action.3 An arrangement of four additional Lewis machine guns was tried on the J9125 prototype, by installing two guns on the upper wing and two guns on the lower wing. This kept the guns free from the propeller arc, but they increased the gross weight to 3,900 lbs (1,770 kg) as opposed to the earlier weight of 3,200 lbs (1,450 kg). The Air Staff was not very enthusiastic about the heavier armament and they were removed and instead it was equipped with night flying equipment. An experimental Gauntlet with two synchronized Vickers guns and four wing-mounted Lewis guns. The four Lewis guns were too heavy and removed. In November 1937, the Gloster Gauntlet became the first aircraft in history to be directed to a target solely with ground-based radar during night-fighter experiments, by intercepting a civilian airliner over the Thames River.4 In 1940, Gauntlets were still in service in Palestine and while in East Africa, Gauntlets were credited for the downing of an Italian Caproni Ca 133 series bomber and used for limited ground attack sorties. Fourteen RAF squadrons were equipped with Gauntlets, making it the largest operator of the Gauntlet. The squadrons equipped were Nos. 3, 6, 17, 19, 32, 33, 46, 54, 56, 65, 66, 74, 79, 80, 111, 151, 213, 601, 602, 605, 615 and the 616 as well as various training and miscellaneous establishments. Other operators included Australia, which operated ex-RAF Gauntlets with No.3 Squadron, while the Southern Rhodesian Air Force operated ex-RAF Gauntlets in their No.1 Squadron. The South African Air Force utilized ex-RAF Gauntlets in Nos. 1 and No. 2 Squadrons. The Royal Danish Air Force used it in its No.1 Squadron, including 17 aircraft that were produced under license in Denmark. 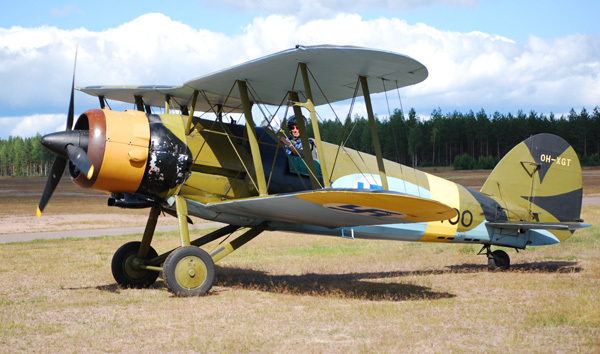 Finland became the second largest operator of Gauntlets flying them in at least five squadrons. Gauntlet IIs flew in the Winter War for Finland against the Soviet Union and were primarily used as trainers and equipped with landing gear skis for winter flying. The Gauntlet was said to be the last truly acrobatic plane of the RAF. It could be airborne in less than 100 yards (91 m) and the landing speed was only 55 mph (88 km/h). However, slow rolls were difficult to perform and the airplane would lose altitude, so this maneuver was restricted below 3,000 feet (915 m). Performing a loop was pleasant. It began with a slight dive and light pressure was applied on the stick, which brought the airplane over the top without any tendency to stall. Visibility in the air was good, but it was difficult to see ahead on the ground, which required weaving back and forth while taxiing. The Gladiator that replaced it, never achieved the popularity of the Gauntlet. With its enclosed cockpit and landing flaps, it was more like flying a monoplane with a top wing. The Gauntlet was a pilot’s airplane. 1. Kenneth Munson. Fighters Between the Wars 1919-39. New York: MacMillan Publishing Co., Inc., 1970. 133. 2. Francis K. Mason. Aircraft in Profile; Volume 1, The Gloster Gauntlet, No. 10. Garden City, New York: Doubleday & Company, Inc., 1965. 5. 3. Philip Jarrett, ed. Biplane to Monoplane, Aircraft Development 1919-39. London: Putnam Aeronautical Books, 1997. 62. 4. Owen Thetford. Aircraft of the Royal Air Force since 1918. New York: Funk & Wagnalls, 1968. 245.